YouTube annotations will not connect to outside links, unless they are approved fundraisers. There is a site you can use called LinkedTube to add outside links, but it is not aesthetically pleasing. When you upload your Powerpoint to Google Drive and/or Drop Box your slides do not always look the same. I ended up saving all my slides as pictures. Then, I replaced the slides that transferred incorrectly with the picture. If you add annotations on YouTube they will not transfer over to the awesome site that makes your YouTube videos safe to watch. I want to make my questions more interactive. I want to make my video more animated. Below is a TED Talk with Dan Meyer, a high-school math teacher. He states that we have created impatient problem solvers and gives ideas as to how to create patient problem solvers. Dan Meyer’s List: How to make patient problem solvers. Last year, I had the pleasure of teaching 2 math classes each day! 😀 I really love math…and pretty much all subjects (this is one of the reasons I want to teach elementary school). It was so amazing to watch my students develop a love for math. I would hear them talking about math in the hallways. When they came to class they would want to share a conversation about math with the class! 🙂 It was so exciting! I tried to make math exciting, applicable, and their own. I would have them create word problems. I would create real life problems for them to solve. However, I never thought about incorporating videos to make problems for them to solve. I love how Mr. Meyer makes videos for problem solving. Instead of just having a picture…actually have the problem on the video or do it in the classroom. Instead of just using a sports word problem…actually show a video clip of a sports game and draw problems out of the actual game. Check out his TED Talk above to get great ideas to incorporate into your classroom. I think this is the assignment…I am not sure though. This Summer, I decided to take 2 graduate classes, 1 undergraduate class, and test out of 3 classes through clep exams in order to complete my Masters program and Virginia licensing requirements. I am also planning large events, getting ready for my new teaching job, moving, and all the other stuff I always do. I have to complete all this before I leave for a mission trip to Kenya in 2 weeks! I am really excited!!!!!!! My mind just is not working as well as I would like, but it is getting done. 😀 Praise the Lord! 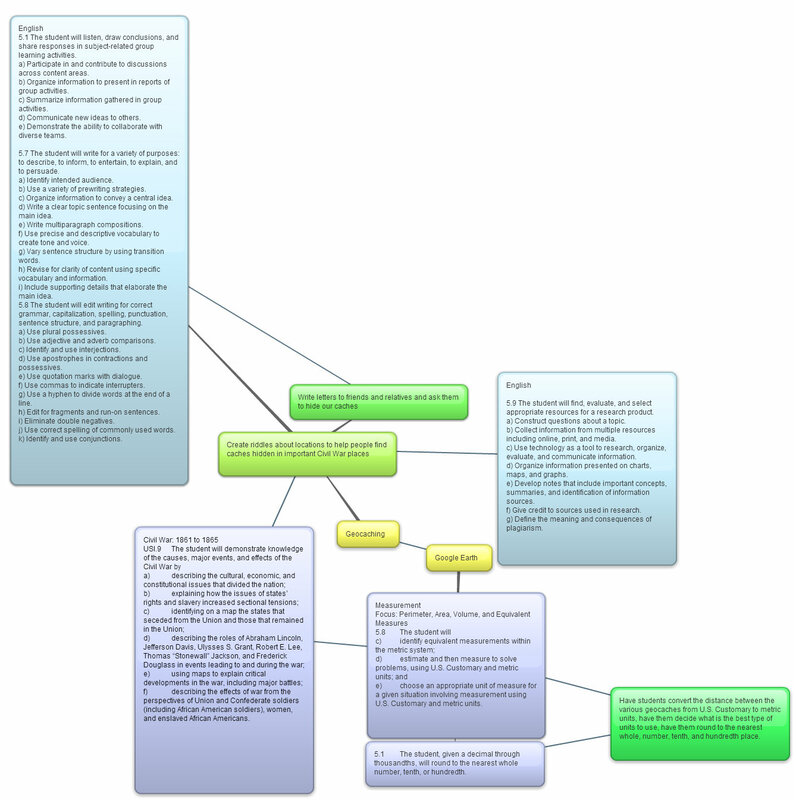 Now that my rambling is over…Here is a mind map I made for a unit I am working on that covers the Civil War. I made the mind map on this awesome website! A few of my classmates and I made a digital story based on one of my favorite books. I loved creating a digital story and can’t wait for my students to make one. I might be semi-obsessed with Google. Today, I was listening to an awesome podcast on EdReach about Google Glass!!! I often see things all around that I wish I could share with my students. The teacher they interviewed talked about how now he can easily record what he sees and share it with his students to teach. I feel like my mind is overflowing with different ways I could use these in and out of the classroom. Especially, if they changed them to include more features…like being completely 3D and being able to manipulate images with your hands… What are some ways you would use Google Glass? What would you like to see them change about Google Glass? I love the idea of a flipped classroom! I think it would be wonderful if the students could watch the lectures at home at their own pace and then come into the classroom and have the whole time applying the new learned knowledge. In the blog post To Flip or Not Flip? I love how Stacey Roshan, an AP Calculus teacher, pointed out how a flipped classroom can decrease students’ anxiety level. I also love how in a flipped classroom students can easily go back and review lectures. Shelley Wright in her blog post “The Nuts & Bolts of 21st Century Teaching” gives a beautiful illustration of student-centered collaborative learning. She discusses her struggles to let go of control. How it was difficult but so rewarding to allow the students to figure it out and just be a co-collaborator. Her class was assigned to turn the classroom into a Holocaust museum. One group of students discovered that the average inmate only ate 300 calories a day. When you allow your students to discover and collaborate with hands-on projects it is amazing how excited they get. Their curiosity and excitement help them to discover and retain more than they would if you just dictated to them. The teacher has become the student. Learn with me! One day at a time, learning to become a true teacher. The daily adventures of a newly graduated, third grade teacher, adjusting to being a working mom, anxiously awaiting summer!. Teaching and technology...preparing today's students for tomorrow.